In an era of "lean IT," the centralized management capabilities of cloud-managed Wi-Fi make it an attractive option to manage and maintain wireless LANs (WLANs) across multiple locations. The decision to move WLAN management to the cloud requires one key assurance: end-to-end security from user devices to the cloud. This means that user data must be protected over the WAN and in the data center. These security measures should not require on-staff WLAN security expertise to manage. And security measures should be largely transparent to users. 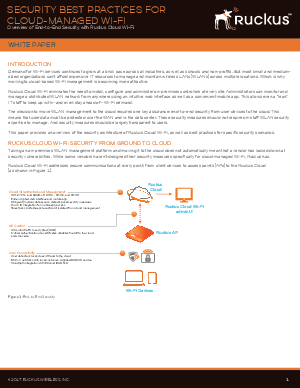 This paper provides an overview of the security architecture of Ruckus Cloud Wi-Fi, as well as best practices for specific security scenarios.